Lake County is a landlocked county in the northern coast ranges that is centered on Clear Lake, the largest natural lake entirely within California (Lake Tahoe is larger but is partially in the State of Nevada). 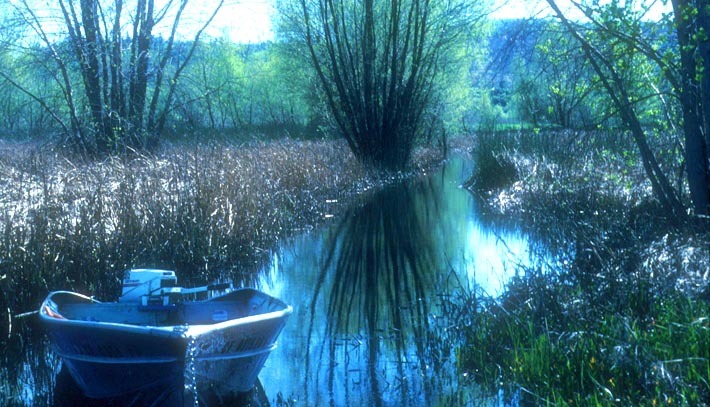 There is another "Clear Lake" in Modoc County up in the northeastern corner of California; the Clear Lake in Lake County is a favorite resort area for boaters and fisherman and, lying among oak woodlands, the lake is available all year [the other Clear Lake in Modoc Co. freezes in winter]. The northern quadrant of Lake County is mountainous and covered with coniferous forest; there is a smaller lake here (Lake Pillsbury). Snow Mountain reaches to 7040' elev (2146 m) on the Colusa County border. Clear Lake once had very impressive nesting colonies of Western Grebes; their die-off due to pesticide run-off was mentioned early by Rachel Carson in Silent Spring. Today, Clear Lake still has an abundance of waterfowl — especially during shad runs in winter — and there is a diversity of marsh and shore habitat among extensive oak savanna and chaparral. Borax Lake often hosts thousands of diving ducks. Although there are now Indian casinos scattered between the small towns, it is still very much a rural county. I was born and grew up in Lake County. I lived right on the lake shore, and learned all my first birds there. When I ventured beyond our yard, my favorite birding spot was Anderson Marsh near Lower Lake, at the south end of Clear Lake. It was undeveloped wild country when I was a kid. Now there is a housing development nearby, but I was surprised during a return visit to Clear Lake in 1996 to find that Anderson Marsh itself was now a wildlife preserve. 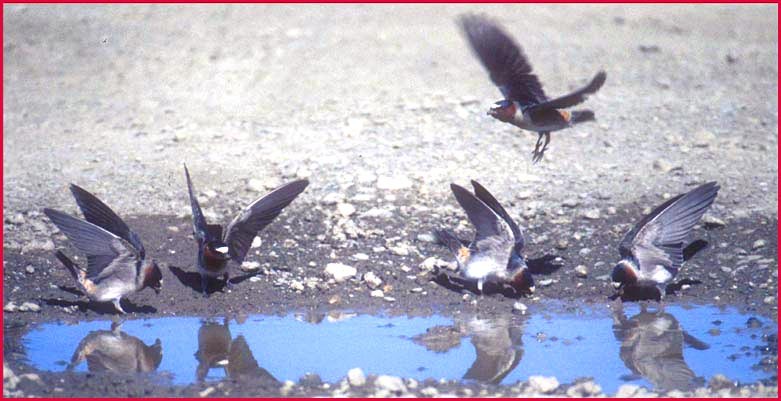 The mud-gathering Cliff Swallows were photographed there in early April 1996; a close-up view of two of them is below left. Although I now rarely get back to my little home town, Rita & I did join Jerry White on a gorgeous spring day in 1998, up in the northern part of the county. 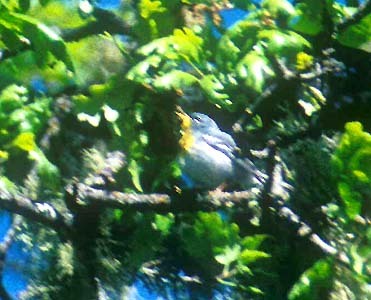 During our rambles we found a singing Northern Parula at Lake Pillsbury -- a first Lake County record. 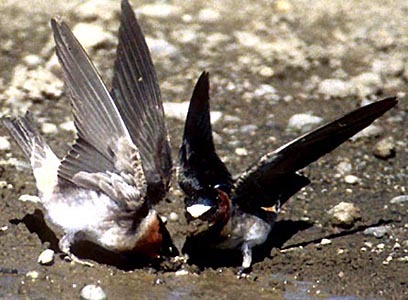 It was singing from the top of a large oak (photo below right, 17 May 1998). My first photos were with print film. Two shots that I took in the mid-1960s are scanned below (upper row). They show the view of Clear Lake and Mt. Konocti from our pier (left) and a view back toward my childhood home from the end of our pier during an exceptionally rare snowfall (right). At only ~1500' elev (500m), snow did not stick very long. The bottom photo is a more recent (Apr 1996) shot of Anderson Marsh. The little skiff is not mine, but it very much recalls one that I had as a teenager.